Throughout histry, photography has developed to become a field that not only captures the memories of cultures and people around the world, but also helps to shape these memories. The famous saying that: “a picture can sometimes be worth more than 1000 words” has certainly held true in many cases and certain photos, exhibitions and examples of photography stand out as having truly transcended borders and achieved much more than “1000 words” could have, so to speak. Especially in the framework of relationships where people do not share the same language or culture, photography can very often serve as a necessary bridge to unite peoples and to get them to think differently about certain issues or themes. The Statue of Liberty was a historic collaboration between France and the United States, which intended to commemorate the lasting friendship between two nations. The French were responsible for the statue and its assembly and the Americans worked on the pedestal, their collaboration on this vast project symbolized unity. The Statue of Liberty is one of the world’s most recognizable landmarks, as well as an enduring symbol of freedom and democracy. The photograph shows the unpacking of the Statue of Liberty, symbolizing a union, a strengthened communication and overall representing cultural diplomacy between the United States and France. At the beginning of the 20th century, the French banker Albert Kahn commissioned his photographers to travel around the world in order to document a variety of cultures. This project, developed before World War I, was intended to perform a mission of peace: bringing the outside world closer to home. In order to achieve peace and understanding, Kahn sought to show several cultures through which the knowledge of peoples, landscapes, and monuments could be shared. The result is an ethnographic collection of thousands of colour photos characterized by the auto chrome process of the brothers, August and Louis Lumière. 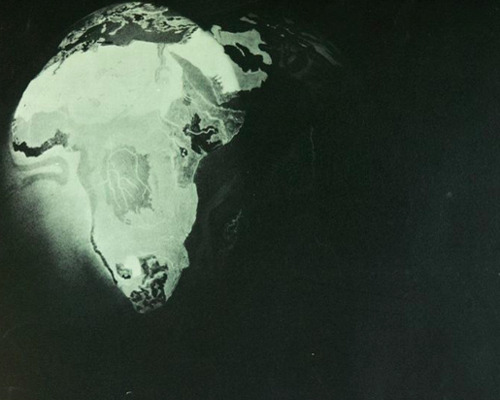 Kahn developed a huge photo archive, which is better known as Les Archives de la Planète. His photographers took photos of people in traditional clothing, historical monuments and scenes of everyday life in many countries of Europe, Asia and Africa. 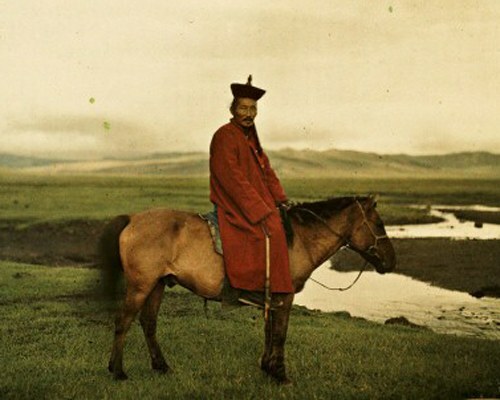 This photograph shows Stephane Passet and was taken in Mongolia, near Ulaanbaatar, on 17th July 1913. The American industrialist Henry Ford, founder of the Ford Motor Company, gathered the entire 12,000-strong workforce of the Ford Motor plant at Highland Park, to photograph them all together outside of the building. This photograph was taken in 1913, when the world’s first fully-fledged assembly line was installed at the plant. The photo cost thousands of dollars to organize and produce which was fitting for a company whose axiom was “Time equals money”,. 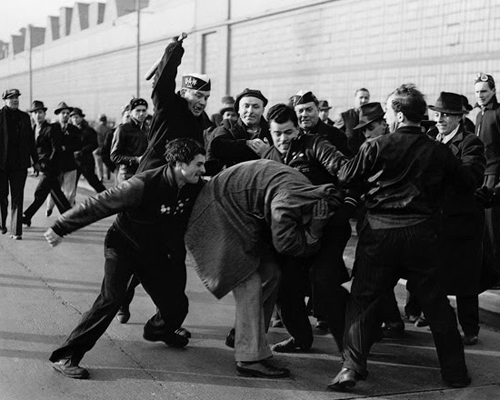 The Workers were paid $2.34 a day and employed for a nine-hour working day. Assuming a working day was lost because of the photo, Ford paid out $28,080 in daily wages, almost equal to the amount of venture capital he had to initially start the company in 1903. In addition, Ford lost out on making 600 cars (in 1913, Ford produced 250,000 cars annually), each of which cost $600. In total, the cost of the photo was over $9 million in 2013 dollars. 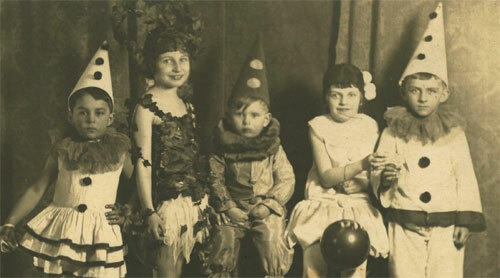 During the First World War, on the 25th of December, a festive atmosphere reigned for a short period of time. 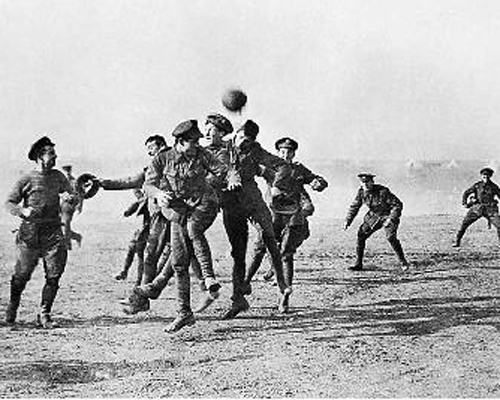 A Scottish soldier took out a soccer ball and a soccer game was started. The soldiers played for at least an hour and during this short time the war was forgotten and Christmas was celebrated. In words of a German Lieutenant: ‘the Scots played with Scottish skirts wearing nothing underneath’. When Commanders realized what was happening, the match was ended and their fraternization was rapidly terminated. The final score was three goals to two, and the German soldiers won. This curious scene made clear that no war could extinguish human understanding. For a brief moment, cultural diplomacy reigned during the First World War. 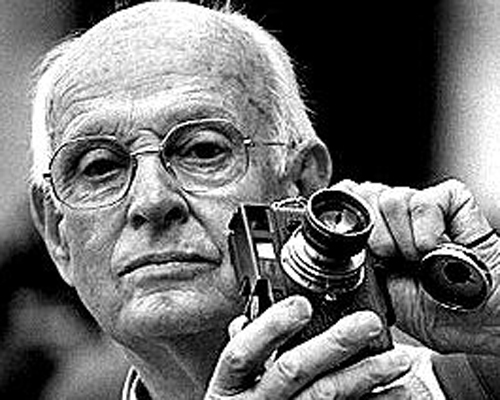 Henri Cartier-Bresson, a French photographer, was considered one of the major artists of the 20th century and the father of photojournalism. His pictures show the spontaneity of photojournalism and street photography around the World. Throughout his career he took photographs worldwide and covered such important events as the Spanish Civil War, his visit to Mahatma Gandhi, the Chinese revolution, and George VI's coronation. During the World War II Cartier-Bresson joined the French army and was captured by German forces when he became a prisoner of war. Three years later he escaped and returned to photography and film. Henri Cartier-Bresson allowed us to appreciate some of the most important events in recent history. Furthermore, he was the first Western journalist to enter the Soviet Union. One of the most important works in which he participated was The Family of Man, a collection of black-and-white photographs by the world’s greatest photographers. These photographs were significant in the way that they presented in detail the human unity that underlies all cultural, ethnic and other differences. The Pulitzer Prize for Breaking News Photography is a continuation of the Pulitzer Prize for Photography, annually awarded for journalism. It was established in 1942 by provisions in the will of American (Hungarian-born) publisher Joseph Pulitzer, and is administered by Columbia University in New York City. Despite being an American award, the photos show events of public importance around the world. The prize is granted to a distinguished example of breaking news photography in black-and-white or colour, which may consist of a single photograph, a group of photographs, a sequence, or an album, that has captured the shock, chaos and heroism in dramatic situations. In addition, it is one of the highest honors in photojournalism. For decades, Pulitzer Prizes have allowed us to understand the experiences of both the photographer and the photographed, whilst learning about some of the most significant events of the last century. UNESCO’s Human Rights Exhibition, created in 1949, was the first international event that sought to visually represent the history and meaning of the then-recently adopted Universal Declaration of Human Rights. Using the exhibition as a platform for critical debate on contemporary human rights culture, the symposium explores insights provided by UNESCO’s first attempt to visualize and historicize the Universal Declaration of Human Rights. The Family of Man was a photography exhibition curated by Edward Steichen. It was first shown in 1955 at the Museum of Modern Art in New York. According to Steichen, the exhibition represented the "culmination of his career." The exhibition contained 503 photos from 68 countries, and represented 273 photographers (163 Americans). The exhibition was selected from almost 2 million pictures submitted by both famous and unknown photographers worldwide. These photos offer striking snapshots of the human experience and include themes of birth, love, and joy, but also touching war, privation, illness, and death. Steichen's intention was to prove, visually, the universality of human experience and photography's role in its documentation. 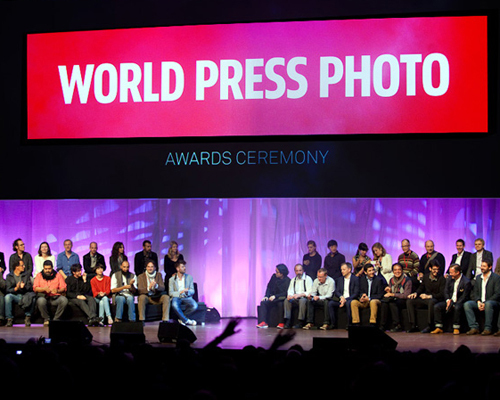 / World Press Photo is an independent, non-profit organization based in Amsterdam, Netherlands. Founded in 1955 the organization is known for holding the world's largest and most prestigious annual press photography contest. Since 2011, World Press Photo has also organized a separate annual contest for journalistic multimedia productions in association with Human Rights Watch, the annual Tim Hetherington Grant. During the Cold War era when Berlin was divided into East and West, tensions were high and the then Berlin Wall was a mere barbed wire fence. Two young men were about to make history as one ran to the other side whilst the other captured it on film. Conrad Schumann was the young soldier who jumped the Berlin Wall at the early years of post war Germany. It was a time of unrest for the country and the two factions were on the brink of hostility. Schumann jumped the fence that bisected Berlin and ran to freedom on the side of West Berlin. 19-year-old photographer Peter Leibing captured this image at the ideal moment and the photo became a well-known memory for many. This iconic photo made an appearance in newspapers and museums, and it is still a significant image today. Schumann’s sprint and hurdle over the fence was a fleeting moment that would have been lost without the help of a camera lens and a roll of film. It was a defining moment for the young soldier’s life as well as for the young photographer. The iconic image elicits stories of freedom and defection at a time of unrest and unresolved danger. England and Brazil arrived at the 1970 world cup in Mexico with high hopes. The game was very closely fought with Brazil finally winning 1 – 0. This game still had one more iconic moment to offer: Pele and Bobby Moore, the great striker and the great defender, exchanging their jerseys. What makes this photo timeless is that their body language makes is difficult to determine who had won or lost. Both players considered it a defining moment of their careers. The photo, which would later come to symbolize the World Cup and Sport in general, was taken by John Varney. 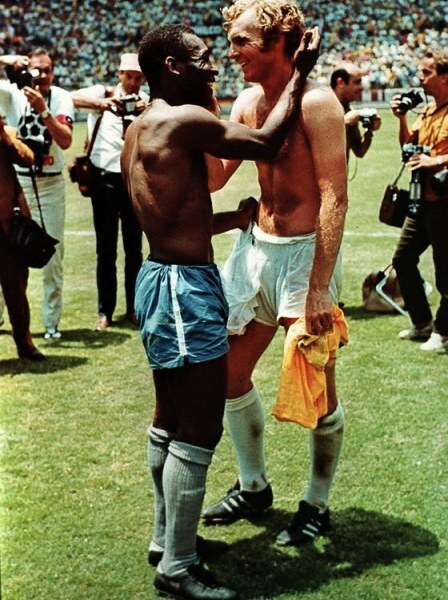 After the final whistle, Varney stayed close to Bobby Moore, hoping that Pele would approach. He did, and the rest was photographic history. In 1979, the Italian pavilion at the Venice Biennale hosted an exhibition of photography, and it was one of the first major photographic events in the country. 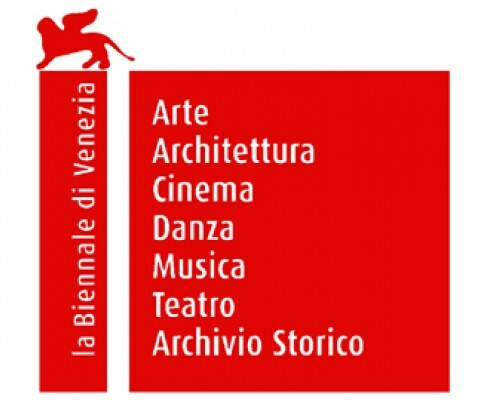 It was organized on the initiative of the Municipality of Venice and UNESCO, with the artistic collaboration of the International Centre of Photography in New York, directed by Cornell Capa. The aim of the project was to document the significance of photography in every civilization and culture. The division into different exhibits paid homage to recognized photographers such as Lewis H. Hine, Eugène Atget, Alfred Stieglitz, Edward Weston, Tina Modotti, Robert Capa, Henri Cartier-Bresson, Eugene Smith, Weegee, Robert Frank, Diane Arbus. Furthermore, it explored genres such as Images des Hommes, The Land, Il Mondo del Colore, Japan, Italian Contemporary Photography, the Polaroid Collections, Contemporary American Photographers, Contemporary European Photography. The selection and the proposal of the authors yielded 25 exhibitions, which involved more than 500 authors. Forty-four Italian authors were selected in order to portray contemporary Italian photography. 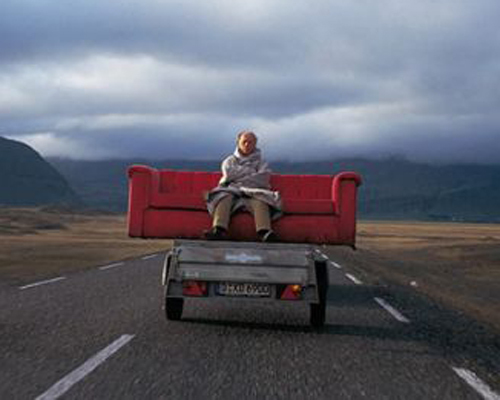 The “Red Couch” is a project from the photographer and video artist, Horst Wackerbarth. For over thirty years he has travelled around the world with his red couch, capturing interesting personalities sitting on his couch in the most diverse surroundings. He invites people to take a seat on his couch and interviews them about topics such as their work life and their individual happiness as well as about love and death. The red couch has therefore become symbolic – a place where all different religions, races, social classes, cultures, habits and viewpoints of different individuals, scenes, majorities and minorities are being brought together on one couch. Today, he had more than 700 people in over 50 countries with 53 languages as guests on his couch. Marta Minujín is an Argentinian conceptual and performance artist. A conversation with Andy Warhol in an art gallery in New York regarding the Latin American debt crisis inspired one of her most famous pictures. The set of ten pictures shows the artist symbolically handing the corn to Warhol as a way to pay Argentina’s external debt. The photographic sequence is divided into three stages: the first shows enmity and discomfort between the two countries: the existing debt produces bitterness and therefore they both appear on their back with their arms crossed. The second stage involves a change in position on both sides and there is openness to dialogue and negotiation to cancel the debt. And finally, the third stage, in which both parties seal the deal and cancel the obligation using the “Latin American gold” -defined with her own words- as payment. At the Nasir Bagh refugee camp in 1984, Gula's photograph was taken by National Geographic Society photographer, Steve McCurry. 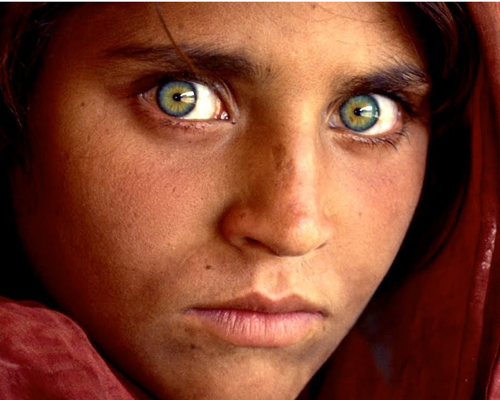 The image of a girl’s face, with a red scarf draped loosely over her head and her piercing sea-green colored eyes staring directly into the camera, became a symbol both of the 1980s Afghan conflict and of the refugee situation worldwide. The image was named "the most recognized photograph" in the history of the magazine, and the cover itself is one of the most famous of the National Geographic. Many photographs taken by the photographer Oliviero Toscani during his collaboration with the Italian brand BENETTON, represent the problem of prejudice, and attempt to combat it. They attempt to abolish racist beliefs by visualizing and emphasizing the racial diversity which can be found in one nation. They illustrate a mixed and miscellaneous love and are not scared to situate bodies close to each other, paying no heed to the colour of their skin. (Toscani 1997, 47.) Moreover, all of the photos, which show different races promote ideas of tolerance, respect for diversity among them, and propagate peace among all nationalities and nations. (Benetton 2012). This festival focuses on geopolitical, social, cultural and religious changes and more. The photographic medium is used, as a means to overcome the limitations imposed by partisans' issues. Photography unites the multiple nationalities all over the Mediterranean. Photography is a means of expression that covers a very broad spectrum from documentary testimonial to a true visual art in its own right. It is organised by authors from different backgrounds who constantly renew what we are given to see. 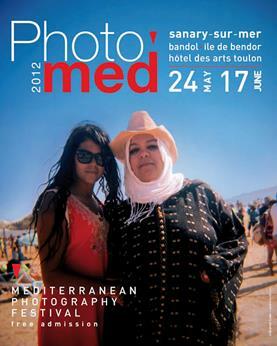 Photomed intended to establish a platform from which photographers can help us to better understand the Mediterranean world and what its populations share. The festival identifies with geopolitical, social, and religious changes and other matters, and presents art , especially photography, as a means to overcome the limitations imposed by partisans' issues. Established in 2001 Pingyao International Photography Festival is considered China’s Longest Running and Largest International Photo Festival. 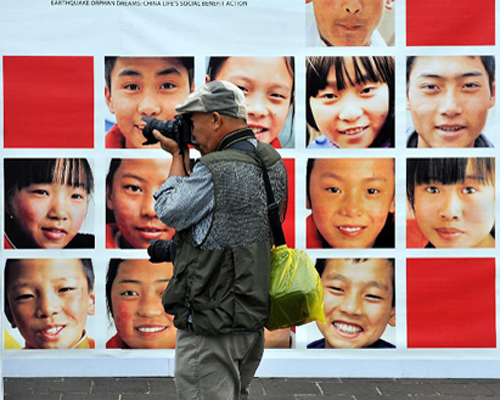 The PIP festival began as an attempt to place recent Chinese photography on a global context. PIP grew sharply in stature in 2002 when Gao Bo, a photographer and architectural designer, was invited to view a large section of new experimental work by Chinese artists. The results, though impressive to foreign critics, so dismayed local officials and conservative photo unionists that in 2003 the so-called conceptual photograph component was eliminated and replaced by a resurgence of historical, news, fashion, travel, and "beautiful scene" images. When it became clear the 2004 instalment of the PIP would follow the same model, Jullien withdrew to start an alternative event, an international biennial devoted exclusively to progressive fine-art photography, inaugurated in 2005 at the Guangdong Museum of Art in Guangzhou. By then, however, China's experimental photographers had gained international attention, and their newfound market viability liberated them to pursue their conceptual projects without undue livelihood concerns. In 2004 University of Chicago scholar Wu Hung (whose expertise encompasses both classical and contemporary Chinese art) and Christopher Phillips, curator at the International Center of Photography in New York, co-organized the groundbreaking Between Past and Future: New Photography and Video from China, a sixty-artist survey that toured seven international venues over a two-year period. Despite Chinese photography's now global stage, the PIP Festival remains a relevant forum for the discussion and presentation of new photography each year. After September 11: Images From the Ground Zero was an exhibition carried out in 2002, composed of 27 images taken by Joel Meyerowitz it had travelled to more than 60 countries by the end of 2004. 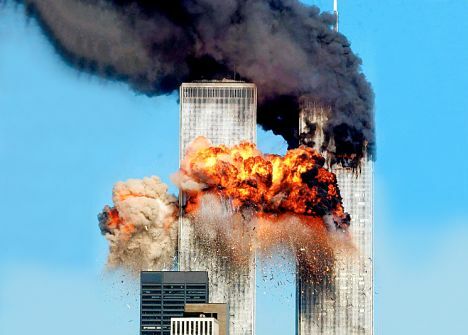 Promoted by the American embassies and consulates throughout the world, it was intended to shape and maintain a public memory of the attacks on the World Trade Center and their aftermath. It was a cultural diplomacy initiative that helped to sell America’s story to the world. 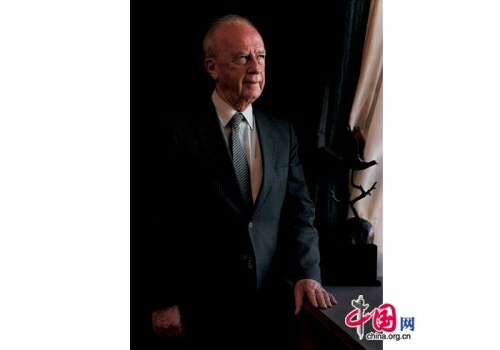 It changed the political framework and intended from that moment to actively promote the diplomatic role of culture. 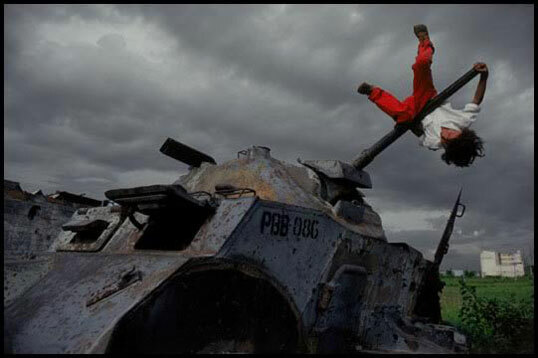 Although James Nachtwey has spent most of his career photographing war, he considers himself an anti-war photographer. Living in the midst of wars and natural disasters has taken its toll on Nachtwey. Nevertheless, he continues working because of his strong belief that his photographs can make a difference. Nachtwey, convinced of the effect his pictures have on viewers, has never stopped hoping to fight the horrors of war, hunger and poverty through his work. Inferno is the only major monograph of humanitarian and photojournalist James Nachtwey, five-time winner of the Robert Capa Medal for Photography which features brutal photographs taken from 1990-99 and is inspired by a passionate belief that human beings will change for the better after seeing such inhumanity. 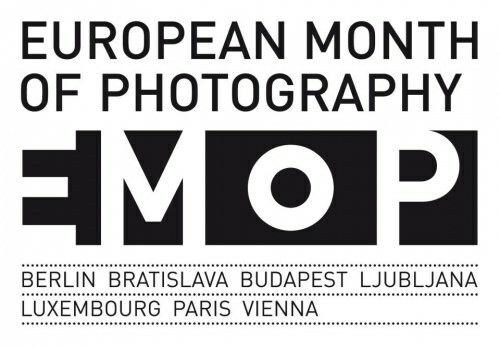 The European Month of Photography is a network that works on a tight schedule with four meetings a year and a bi-annual production of exhibitions in each member city, curatorial activity is supported mostly by University researchers resulting in publications on photography. The project dates back to 2004, when Paris, Berlin and Vienna joined forces to exchange exhibitions through their institutions that deal with photography. Later Bratislava and Luxembourg also joined, as well as Budapest, Ljubljana, Athens and Rome. The aim is to cooperate on the European level, to exchange information and experiences, to learn and encourage creativity and support younger artists. The network does so by showcasing a joint exhibition of contemporary photography, which is shown simultaneously in a smaller exhibition in the partner cities. Every two years Berlin participates on this initiative, which involves more than 100 museums, galleries, institutes and project spaces. Exhibitions and cultural events make the festival the largest throughout Germany and attract more than 500000 visitors. Every year all exhibitions and events focus on a different specific topic decided by a jury consisting of five photographic experts. Exhibitions but also lectures, discussions, lecture performances and talks enable visitors to get various perspectives of the theme. JR attempts to show that there is no difference between Israeli and Palestinian people working in the same job. 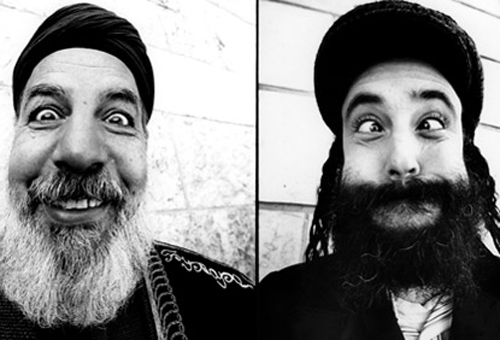 The Face2Face project tried to show that despite their differences, Israelis and Palestinians are similar enough to be able to understand one another. Israeli and Palestinian men and women who work the same job agreed to laugh or cry, to scream or pull faces in front of JR’s lens. The portraits created were hung up face to face, on either side of the Separation Wall and in several surrounding towns. JR photographed and his partner Marco wrote, together succeeding in creating the largest unauthorized 20 urban art exhibit in the world. The project’s goal was to show, through images, that art and laughter combined can break down prejudice. The Singapore International Photography Festival is a biennial festival, which aims to promote appreciation for photography amongst the wider community. It gathers people from around the world with a common goal: to advance art and photography. It aims to be an international arena for critical thought and academic discourse on photography in Southeast Asia. SIPF functions also as a platform to discover and encourage Southeast Asian photographers onto the international stage. At the core of SIPF is a firm belief that everyone can enjoy photography. In addition there is a special collaboration with Singapore Art Museum, to showcase the contemporary photography practice in Southeast Asia, as well as with Noorderlicht International Photofestival in Groningen, the Netherlands, for a themed open call “An Ocean of Possibilities”. This partnership, which explores the search for the path less travelled, translates to an opportunity for double exposure as selected artists exhibit their works at both festivals simultaneously. 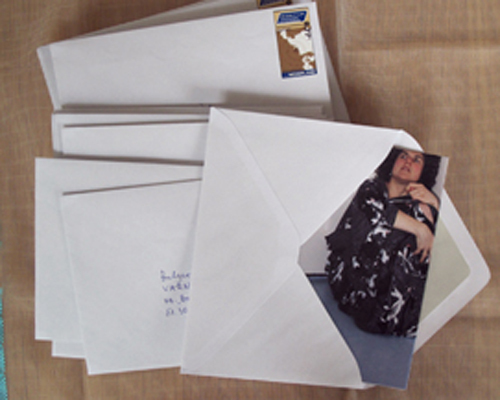 Letters to my mother is Hristina Tasheva’s project, who after her graduation emigrated from Bulgaria to The Netherlands. Despite having a university degree, she had to work as a cleaner and, as an immigrant in Western Europe her expectations were crushed by her illegal status. In her own words, this disillusionment gave birth to her work, becoming influenced by time and geography and using photography as a universal language. In her photography project “A letter to my mother” she describes her difficulties during the first years and the sense of loss of personal identity. In order to take pictures she asked the housewives of the houses she was cleaning to lend her their clothes and their houses, making the culture and the identity of the others her own. Lagos Photo Festival is the first international art festival of photography in Nigeria, launched in October 2010 and sponsored by Etisalat Nigeria (who have been the main sponsors since its inception). It is organised by the African Artists’ Foundation (AAF) as part of an on-going project designed to use art in public spaces - "art reclaiming public spaces" - as a medium for increasing societal awareness. The festival includes workshops and classes for professional artists, art fairs and a series of indoor and outdoor exhibitions that run simultaneously throughout the festival period. The opening is marked by a month-long indoor exhibition at the Eko Hotel and Suites with over 1000 guests in attendance as well as outdoor exhibitions citywide. 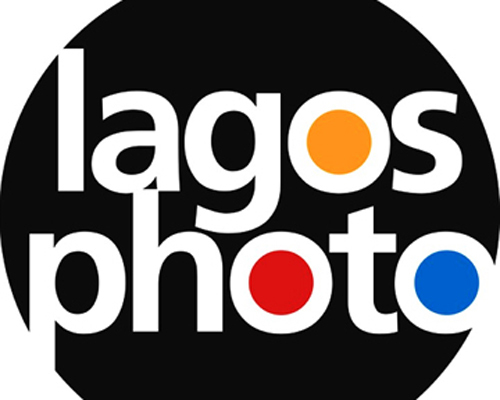 Lagos Photo is held annually and features emerging photographers alongside established photographers. This initiative was organized, firstly, to raise awareness through photography about the importance of the 2003 UNESCO Convention for the Safeguarding of Intangible Heritage, and secondly, to strengthen the capacity of professional photographers by exploring different approaches to documenting intangible cultural heritage. It was the result of a capacity building exercise held in Kenya, thanks to a fruitful collaboration of UNESCO’s Intangible Cultural Heritage Section, with the Permanent Delegation of Kenya to UNESCO and the Japanese Government. In fact, the project was financed by the Japanese Funds-in-Trust as part of the partnership with UNESCO and the Kenya Ministry of State for National Heritage and Culture. 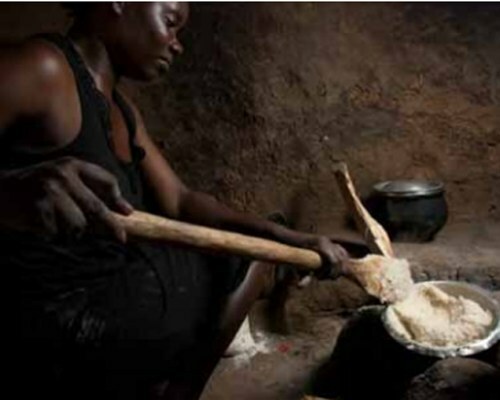 The images document social practices, knowledge and skills related to aspects of the intangible heritage of Kenyans living in Nairobi and Kakamega. Distinct in every detail, these photographs remind us of the importance of safeguarding humanity’s intangible cultural heritage. In the words of UNESCO Director-General Irina Bokova, “No culture stands alone. Our intangible cultural expressions find meaning in their relation to those of other peoples. The power of these photographs are clear in their ability to remind us of everything that we share. Culture is a force for dialogue, exchange and understanding between peoples. Culture is also a force for development. It provides the prism through which we understand the world and the tools by which we shape our environment. Sustainable development can only be achieved if cultural contexts are taken into account”. 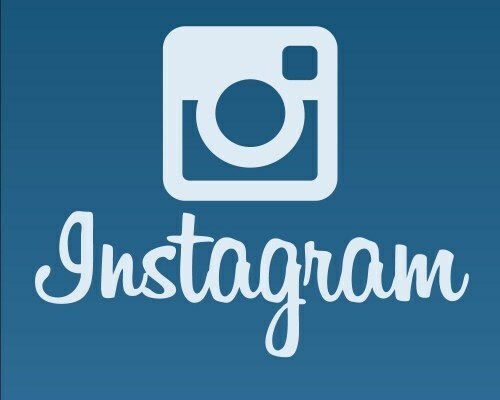 Instagram is a free online program and social network that enables users to take, edit and share photos with other users via Instagram's own platform, email, and social media sites. Instagram's editing features include various digital filters, one-click rotation and optional borders. Photos can be shared on one or several social media sites at once with a single click. Thanks to this tool people from all around the World can share, rate and exchange pictures creating an international web of connections. The way to find new people to follow on Instagram is through the photos themselves. 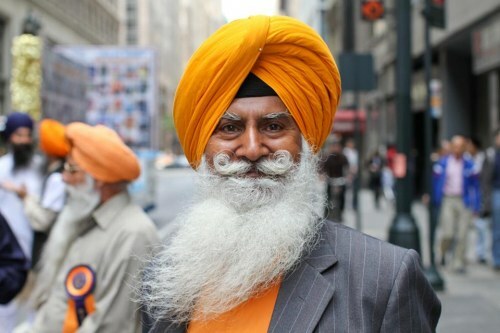 Humans of New York (HONY) is a photo blog and bestselling book featuring street portraits and interviews collected in New York City. Created in November 2010 by photographer Brandon Stanton, over 6,000 portraits have been gathered thus far. Humans of New York has developed a large following through social media, and has over 9.3 million followers on Facebook as of 23 August 2014. At the 2013 Webby Awards, Humans of New York won the Webby for "Best Use of Photography" and the People's Voice Award for "Best Cultural Blog”. In December 2013, Stanton was named one of Time Magazine's 30 Under-30 People Changing The World. The UNHATE advertising campaign was launched and promoted by Fabrica, the communication research centre sponsored by the Italian brand Benetton Group. The project UNHATE, meaning “against hatred”, is a series of provocative photomontages representing the theme of the kiss as a universal symbol of love, exchanged between some of the great world political and religious leaders: Barack Obama and the Chinese leader Hu Jintao, Angela Merkel and Nicolas Sarkozy, Pope Benedict XVI and the Grand Imam Ahmed el-Tayeb, Palestinian President Mahmoud Abbas and the Israeli Prime Minister Benjamin Netanyahu. Closeness between peoples, faiths, cultures, peaceful understanding of the others’ reasons are the guiding principles of this communication campaign. These symbolic images of reconciliation -which were the cause of debate at international level- are used to prompt a reflection on how politics, faith and ideas, even if diametrically opposed, must lead to dialogue and not to hatred. The campaign is part of a much wider project aiming to promote a culture of un-hate against physical, social, political or ideological borders. When this unlikely snapshot of lovers entangled in a tear-gas filled street with riot police in the fore and background emerged, it started a national campaign against violence. 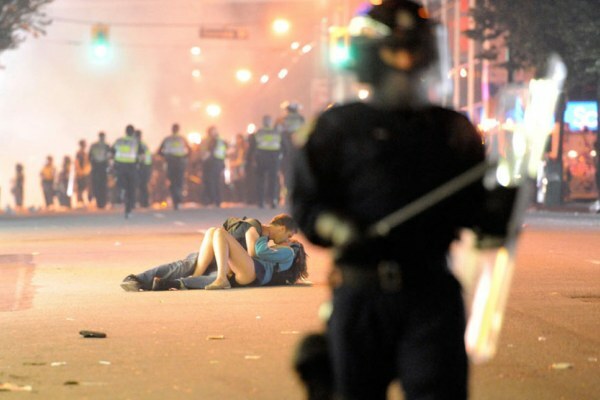 The "Vancouver riot kissing couple" — Coquitlam-raised Alexandra Thomas and her Australian boyfriend Scott Jones showed that there is always place for love no matter of circumstances. 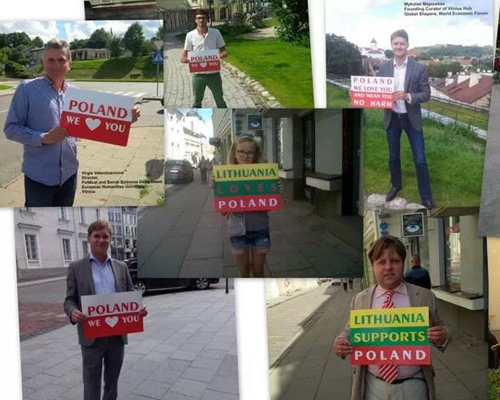 Despite their stormy relationship, Poland and Lithuania have supported one another in difficult circumstances. When Poland was invaded in 1939, Lithuania provided a place of refuge for Polish officers. In 1991, when Lithuanians were rebuilding their state under constant threat of the Soviet army, Poland expressed a readiness to host a Lithuanian government-in-exile in Warsaw, should the need arise. In times of peace, military cooperation was thriving, symbolised by the visit of general Rastikis to Warsaw (March 1938), or more recent Polish-Lithuanian-Danish army manoeuvres in Rukla (1995). Analysts from ‘The Economist’ suggest that current Polish-Lithuanian tension is caused by personal sentiments of two politicians. The first one is the Polish minister of foreign affairs, Radek Sikorski. His statements about Lithuania seem exceptionally harsh in comparison to his usual control. On the Lithuanian side, President Dalia Grybauskaite is known for her harshness in negotiations with Polish officials. It cannot be denied that personal sympathies and antipathies of politicians can play a role in international relations. This large exhibition provided an opportunity to learn about the lives of European citizens. The photos capture the everyday life of men and women who lived before the Second World War. The exhibition is the result of the collaboration of international partners, such as museums, archives, private enterprises, public administrations and agencies from 13 EU member states, meeting in the Europeana Photography project (EUROPEAN Ancient Photographic vintage repositories of Digitized Pictures of Historic quality). This project saw the digitization of collections of vintage photographs from 1839 with the first example of images from Fox Talbot and Daguerre to the beginning of the Second World War (1939).